I was only a casual fan of the series (not an X-phile), but knew most of the backstory and conspiracies involved. “X-Files: I Want to Believe” is not what you would expect and certainly not what I expected. It’s a difficult film for fans and non-fans for different reasons. It’s good as a stand-alone thriller (with a slight supernatural twist), unfortunately it comes without any of the high-concept “X-Files” lore, which made the long-running series so intriguing. First off, you don’t have to know much about the TV series, expect one crucial point – that the main characters Mulder and Scully, had one of television’s most teasing platonic relationships – one which was never consummated. This new movie takes place a number of years after the series. Scully has quit the FBI and works in a church-run hospital caring for children with terminal diseases. Mulder is a recluse who lives enigmatically in a rural home. When an FBI agent is abducted and a psychic Priest claims to have visions of the crime, Mulder is tracked down and brought in to help with the investigation. Mulder asks for Scully’s help, but she is reluctant – because of her disbelief in the Priests claims, and because she’s devoted to curing a dying patient. The psychic reveals more than both Mulder and Scully expect and they soon find themselves working together again to solve the crime. There’s something off kilter about the film. Midway through I figured out what it was, many scenes are intercut with each other, which, going by the language of cinema, should convey a link or connection. And if the juxtaposed scenes don’t pay off, all we get is false tension. There are many moments of false tension in this film. But Carter asks patience of the audience, and tries to bank these pay offs for later in the film. It’s up to you whether this technique works. Most films, especially genre films, tell you what the film is about in the opening. The audience can therefore rely on their expectations to help them suspend their disbelief. With “The X-Files” there’s such a large backstory from nine years of television that there are very specific expectations associated with a big screen treatment of this story - national security conspiracies about alien abductions, monsters, ghosts and other paranormal activity. Instead we are thrown into the investigative/serial killer genre. As the story progressed, I expected that ‘eureka’ moment to occur which will put us into the X-Files world and take the story to another level – that cinematic level above and beyond television. 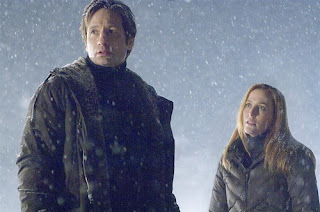 Back in the days of the TV series there were two kinds of episodes – the continuing storyline involving aliens, Mulder’s sister, Cancer Man, and the other conspirators, and the so-called stand-alone ‘monster of the week’ episodes that didn’t connect directly to any episodes before it. “X-Files: I Want to Believe” never went to that next level and by the end of this new film, all we get is a ‘monster of the week’ category. To their credit writers Chris Carter and Frank Spotnitz take the film to another cinematic level of theme and character. Though conspiracies aren’t revealed, a paranormal revelation changes the characters in a profound way which the TV series could never do. Scully and Mulder express emotions and actually act like real people instead of TV characters forced to spin their wheels without an arc to complete. The big screen treatment allows Mulder and Scully to actually change, and confront and solve their emotional conflicts. This is where “The X-Files: I Want to Believe” succeeds. We get see Scully and Mulder cathartically go through profound personal discoveries and reconcile their characters and their relationship with each other, but at the expense of what could have been a bigger, more intriguing and arguably more satisfying “X-Files” film. Enjoy.